I was wondering if there any reinforcement details for strip foundation 1 meter wide by 1 meter deep? The foundation is deep just to accommodate the uplift! Not until after an engineer designs it! Obviously the foundation is going to be designed for minimum allowable reinforcement as I said it is just deep due to the 60KN uplift force! The UDL force is not that big it is just 40kN/m. So what you need is the minimum reinforcement requirements and to provide a reinforcement layout to meet those requirements? Sounds fairly straightforward. I'm still not sure what answer you're expecting. You haven't told us the type of construction or what the governing design code is for where it's being built. There are no universal reinforcement details for a foundation - it has to be designed to meet the requirements of the construction by the locally-adopted code that governs the type of construction. I can provide top and bottom reinforcement for tension and compression with cover 75 mm at the bottom and 50 mm elsewhere but the only thing I’m not sure about is because the foundation is deep is it possible to reinforce the middle even if it neutral where the reinforcement is not needed? Do I need to reinforce the foundation between the top and the bottom as I got big gap between them? I’m using Eurocode!!! You should just provide web reinforcement like a conventional beam. "...is because the foundation is deep is it possible to reinforce the middle even if it neutral where the reinforcement is not needed?" Of course you can put reinforcing in the middle, but as you say, it's not needed, so why would you? With minimum reinforcement around the perimeter to control cracking from shrinkage, and enough to handle the stresses from the anchorage for your uplift load, you should be good. 1 meter thick really isn't that large. 1) I practice in north america and am little more than a tourist when it comes to Eurocode. Do keep that in mind. 2) I'm assuming a condition like the one shown below. 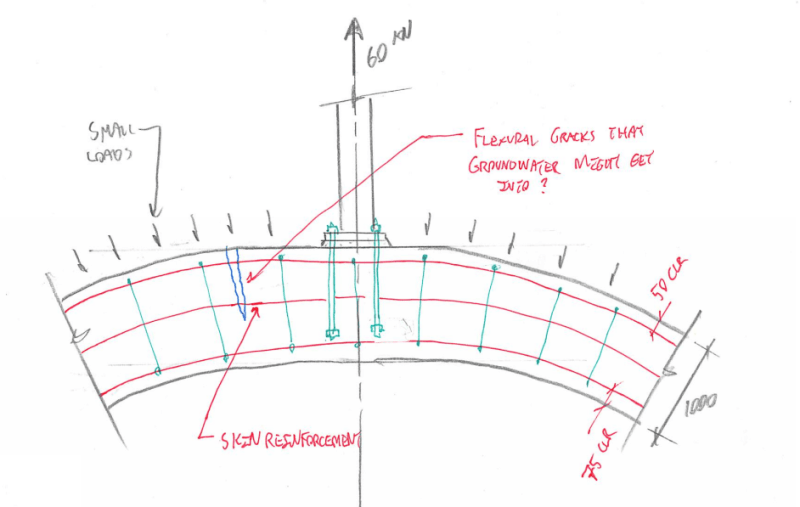 3) Treated as a beam, the codes of many jurisdictions would encourage the use of side face skin reinforcement for a beam 1000 mm deep in order to keep flexural cracking under control up the height of the beam. 4) If groundwater can access your beam, I'd be inclined to provide the skin reinforcement as an aid to keeping crack widths in check and improving durability. If groundwater cannot reach your beam, I'd be willing to forgo the skin reinforcement if pushed to do so.